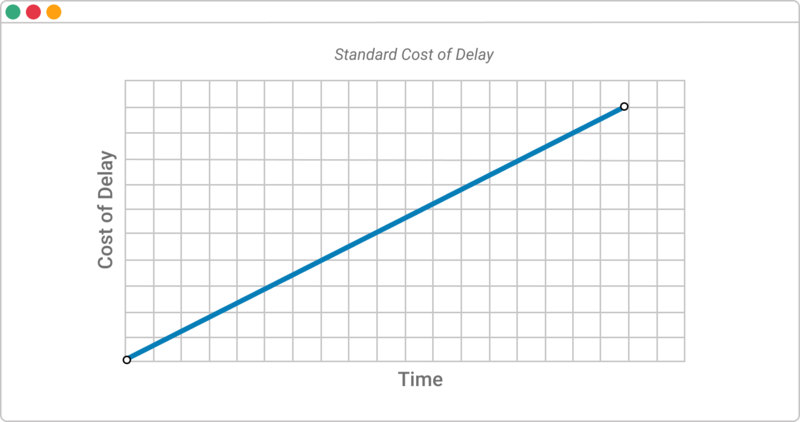 Cost of delay is a key metric in lean management. It combines urgency and value – two things that humans are not very good at distinguishing between. To make decisions, you need to understand not just how valuable something is, but how urgent it is. 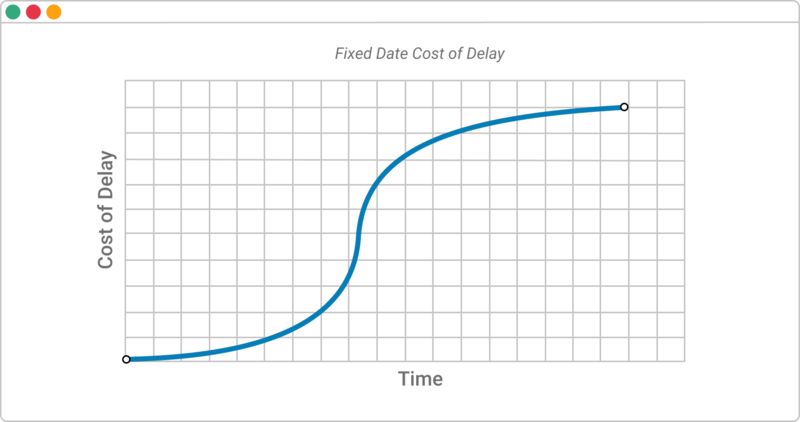 Cost of delay (CoD) is a key metric in lean management that represents the economic impact of a delay in project delivery. Yet most companies do not fully understand or know how and why they should calculate it. This can be a very expensive mistake as delays may cost up to millions depending on the scale your company operates. This is precisely why you need to understand what cost of delay is, how to calculate it and nonetheless how to optimize your process to reduce CoD. The most basic explanation that you’ll find is that CoD is the economic impact of a delay in project delivery. Product development – the amount of money you will lose if you delay the launch of your new product. Software development – the amount of money you will lose if you delay the release of a groundbreaking feature that will give you an advantage over the competition. IT Operations – the amount of money you will lose if you fail to deliver the strategic initiative that the CEO wants. CoD combines urgency and value – two things that humans are not very good at distinguishing between. To make decisions, you need to understand not just how valuable something is, but how urgent it is. How to Calculate Cost of Delay? To calculate potential costs of delay, you need to anticipate the revenue that you will earn per week after you deliver anything to the market. For example, if you are in a SaaS company and plan to deliver a new add-on feature that you anticipate will bring you $20 000 per week, every week that you postpone the release will cost your company this sum. Dividing the cost of delay by the duration of the project will help you gain a thorough understanding of how choosing to prioritize one thing over another will affect your whole organization. Let’s say you’ve got 3 projects planned for the near future. All of them will bring value to your customers and revenue to your company and yet choosing the order of delivery will affect both. This is why you need to quantify the cost of delay for each project and choose the most suitable plan of action. Calculate the cost of delay of each project using CD3 and compare the projects so you can have a clear understanding of the impact of each one for your company. Each of these options will bring different costs of delay to your company and you need to analyze the prioritization impact before rushing into any decision. If you’re practicing Hoshin Kanri, this might be a perfect opportunity to play Catchball with your team. This is a simple task of calculating how much it would cost you if you choose any prioritization mechanism. Continuing with our project example, if you’ve estimated that the total time required to finish all three projects is 8 weeks, you just add up the cost of delay for each project on a weekly basis. Once a project is finished, you remove its cost of delay from the overall CoD until you’re all done. If you prioritize by project duration, you get that the CoD for the first 2 weeks is $170 000. After the shortest project is finished, for the next 4 weeks the total cost of delay is $200 000. When done with the second one, for the 8 weeks required to finished the last – $400 000. All this amounts to $770 000. If you prioritize by project value, you get that the cost of delay for the first 8 weeks is $570 000; for the next 4 – $150 000; for the last 2 – $10 000. All this amounts to $730 000. If you prioritize by CD3 score, you get that the CoD for the first 4 weeks is $340 000; for the next 8 – $440 000; for the last 2 – $10 000. All this amounts to $790 000. 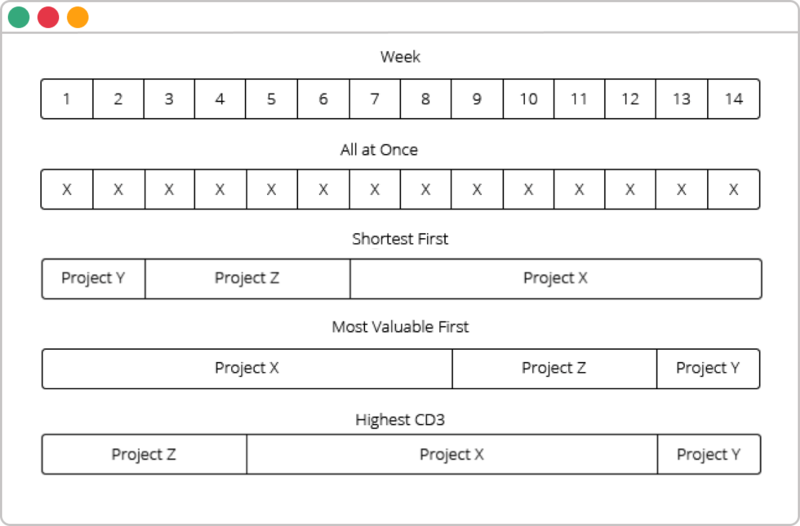 If you don’t prioritize and decide to deliver all three projects simultaneously to the market, all you have to do is calculate the CoD for each project during the required 16 weeks to complete all projects and deliver them simultaneously. As you can see from these 4 scenarios, each decision has a different economic impact on your company. Before you can start optimizing your company for reducing cost of delay, you need to be aware that there are different types of CoD that you will need to address. So far, we’ve addressed only the standard type of CoD. It grows in a linear fashion with time and is easy to calculate as it is not affected by time. This type of CoD is tied to a fixed date or in many cases SLA. It is a typical problem for IT Ops teams. The cost of delay is low or non-existent by a specific time. After it is passed, the cost grows exponentially. For example, if the team fails to respond to a critical problem such as bringing back a website that is down in the negotiated time frame, the service provider will have to compensate the client. Depending on the contract, this may happen by giving a refund or paying a negotiated fee. Cost of delay that is dictated by the urgency of a project grows rapidly in a very short time frame then remains at a constant rate. A great example of such CoD is when you are aware that your major competitor is developing a groundbreaking feature/product that is going to affect drastically your position on the market. If you are unable to match or beat their new value proposition, by the time of release, the cost of delay for you will rise exponentially in a short period of time and continue to rise slowly over time. 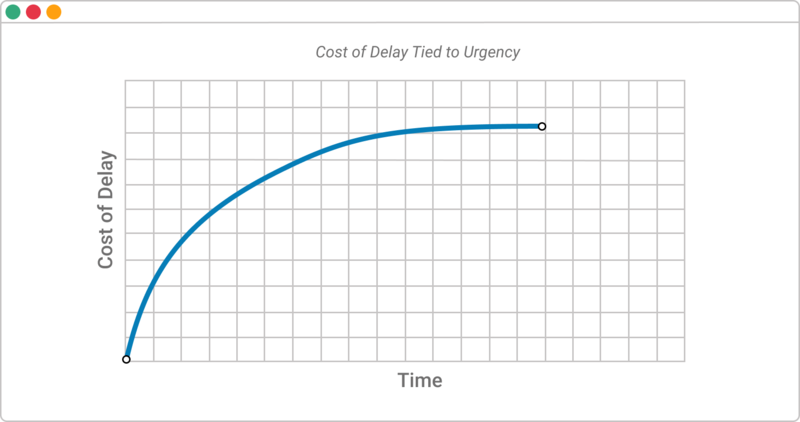 How to Reduce Cost of Delay by Implementing Lean? Surprising or not the major culprit for accruing cost of delay is an inefficient management process. A study by Black Swan Farming reveals that almost 80% of the accrued cost of delay is usually due to wait time, which is one of the 7 wastes of Lean. The Kanban method is a powerhouse tool for optimizing your workflow in order to increase throughput and efficiency. With its help, you can visualize every step of your process even on a global portfolio level, monitor how projects are progressing and where work gets stuck. Among the strongest sides of Kanban for reducing cost of delay are the so-called WIP limits that prohibit your team to work on more than an X number of tasks/projects simultaneously. Gemba walks are legacy of the Toyota Production System that turned the Japanese carmaker into the largest automobile manufacturer in the world. They encourage managers to spend more time on the production floor (even if it is a digital one) and monitor how work is being processed. Gemba walks are a great way to see for yourself what causes any delays instead of relying only on progress reports. While going on a Gemba, you need to look for any imperfections in the workflow and ask questions like why the team is doing something in a specific way. Dealing with the root cause of a delay is the only way to make sure it won’t affect any future projects. The 5 whys is a method for digging deep into what caused any problem including delays. It is an extremely simple way to find the root causes. You just need to repeatedly ask the question “why” to uncover what caused a delay. A3 problem solving model is a 7 step process for preparing a problem report in a short and concise format. It can be applied easily in the context of dealing with delays. The name A3 simply comes from the European A3 paper size corresponding to 11-inches by 17-inches or 29.7cm x 42cm (the size of the report). Because preparing the report involves many people, it is good not only for finding the root cause of any delays but promoting collaboration across the organization. Last but not least, wait time is often caused by too many handoffs and micromanagement. Adopting a culture of shared leadership will allow your frontline team members to take ownership of their part of the process. You should allow each person to make decisions to some extent and make your process more agile. This way you will be able to reduce the wait time accrued from waiting on a bottleneck supervisor who needs to approve every tiny detail even if it has small significance for the organization. As a result delays will be less likely to happen due to cumbersome processes. Implement Lean to reduce the harm of process wastes.